Numerous proxy records have been used to reconstruct Pleistocene climate variations. Before the widespread use of deep-sea sediment cores, it was known that there had been a number of fluctuations of Pleistocene glaciers. Windblown loess deposits have also been used to demonstrate climate change on the continents (Kukla, 1970). However, it was the advent of oxygen isotope analysis of nannofossils in deep-sea cores which really marked the breakthrough in Pleistocene climate reconstruction. Figure 5.9 shows a record of 18O fluctuations for the last 2.5Ma. Within it, distinct cycles are evident that demonstrate changes both in ocean temperature and global ice volume (recall section 3.3.4.1). 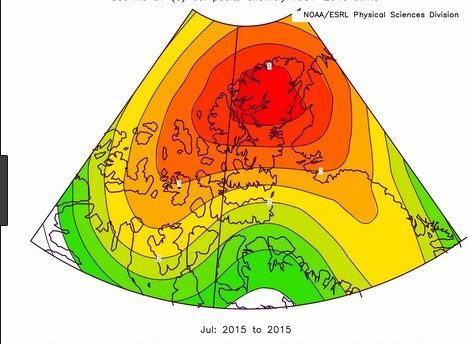 Analysis of the 18O record indicates two basis climate states, one glacial and one interglacial. 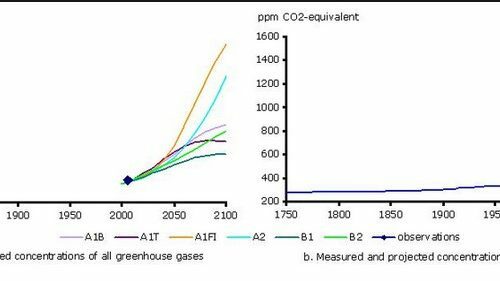 Evidence for these bistable climate state is further provided by oxygen isotope analysis of numerous ice cores. Figure 5.10 shows a 18O profile along the Camp Century (Greenland) ice core (Dansgaard et al., 1984) for the last 130,000 years. The record clearly reveals the last major interglacial period at about 120 thousand years (Ka) and the ensuing glaciation. Sea level estimates from isotope analysis reconstructions (Shackleton, 1988) bear a striking resemblance to palaeo-temperature and ice volume curves (see Figure 5.11). The crucial issue to researchers was to determine the cause of such pronounced variations in the climate. A mechanism was needed which could force changes in climate over periods of tens to hundreds of thousands of years. 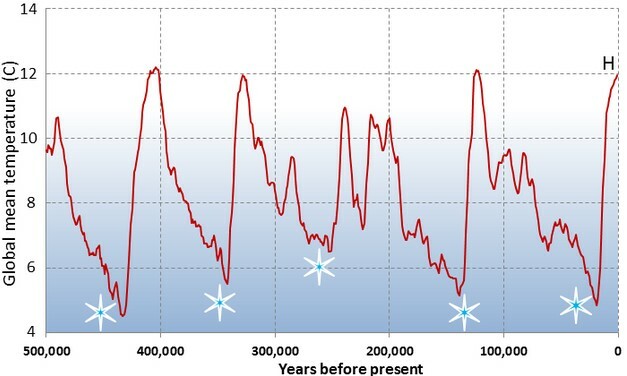 Today, it is generally accepted that the glacial-interglacial transitions of the Pleistocene Epoch are driven by variations in the Earth’s orbit around the Sun.